Quickly slice and julienne fresh foods and produce in seconds. 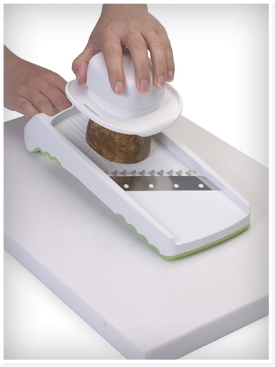 The Progressive International Multi Slicer has 4 settings; thin slices, thick slices, thin julienne and thick julienne so you can prep potatoes for fries, carrots for salads, zucchini for stir-fry and onions for burgers. 4 piece food slicer set includes slicing base, 2 interchangeable blade options and a food holder to keep fingers away from sharp blades. Non-skid base and ridges keep Multi Slicer stable on cutting surface and allow for use over a bowl. Cutting plates store underneath food slicer when not in use. Comfort grip handle for ease of use.